After a major revitalization project, the city of Eau Claire, Wisconsin reopened Barstow Street in early September of 2013. 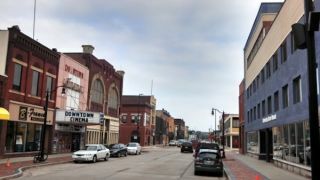 At the heart of Eau Claire’s historic downtown area, and paralleling the nearby Chippewa River, Barstow Street is home to retail stores, restaurants, a theater, churches and the Eau Claire Children’s Museum. The revitalization project included brick-lined sidewalks, attractive street lighting, trees and other greenery. The project also included a new sound system utilizing Community Distributed Design Series Loudspeakers to provide music and announcements for the city’s frequent parades, fairs and holiday celebrations. Designed and installed by Audio Architects of Chippewa Falls, Wisconsin, the new sound system replaced an aging system that had poor sound quality and uneven coverage and lacked a convenient way to connect a microphone for announcements. Nancy Carlson and Andrew Pierson, sales engineers at Audio Architects, designed the new Barstow Street sound system. Carlson said the city wanted a user-friendly system that could play automated background music for street fairs or holiday celebrations and provide live announce audio for parades and other events. They wanted zone level control and they wanted the sound to cover the street and sidewalk areas but avoid the upper levels of buildings, which house professional offices and apartments. The designers added a processor that could store MP3 music sources and play them at scheduled times and powered the system with 70-volt amplifiers that allow flexible zone level control. By carefully aiming the loudspeakers at the street and sidewalk areas and away from the building faces, they were able to minimize sound levels in the upper floors of the buildings.